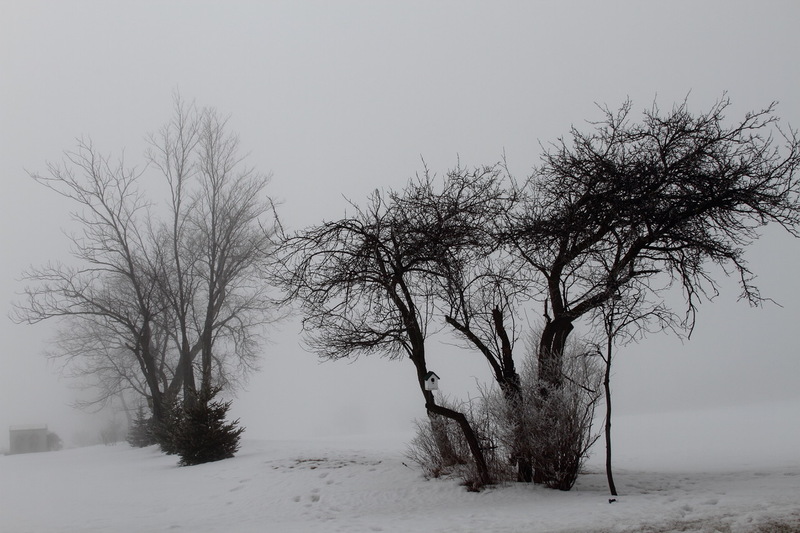 The preceding half dozen blogs focused on finding God. I asked many questions, I wondered and wandered, and sometimes I found my way. When I did I often wrote of love and found God as Love. The next few blogs will especially focus on finding our way in loving, on finding God in Love. The joy of being with God and of trusting God's being with us are movingly illustrated in Old and New Testament in the life of sparrows. Psalm 83:4 expands the joy of being home with God by including “even the sparrow” who builds a nest on the altar in the temple and in Matthew 10:29 Jesus encourages the disciples by reassuring them of God’s presence even with lowly sparrows falling to the ground. 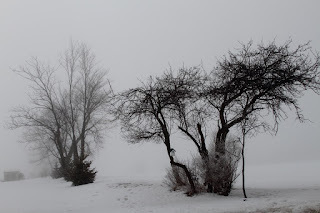 So the picture I’ve chosen for the first of the following love/Love blogs is dark and cold, bare shrubs wrapped in snow and fog. The chill of that scene notwithstanding, however, is the promising presence of a home for the sparrow, on the bare stem in the centre. The blog that follows tries to tell a story of being filled fully with all God’s fullness. I learned that expression from Ephesians 3:17b-19, where the author is confident that in following in the love of Christ we will come to know the unknowable, namely that we will be fully filled with all the fullness of God. I read this as meaning: As we grow in cruciform love, the image of God, who is Love, will be fulfilled in us. In the last weeks of our daughter’s life we experienced this knowledge-transcending love. With that short story I hope to share the deepest meaning of the blogs that follow. A relative who learned how my wife and I cared for our daughter in her last weeks said: I could not do that. I understood. I thought the same when Esther asked us to help her die at home. No more hospitals. We were perplexed and afraid. Seeing our hesitation she asked: is your love not big enough?—How could we refuse?—But could we do it? In death’s face love filled us to overflowing. Ephesians calls this love unknowable and also says that in our loving God makes it fully known. Changing Esther's bed and clothing in the middle of night while giving her affection revealed the paradoxical character of death’s agony matched by love's treasures. Her pain riddled body and immobility often required 2 hours for us to clean the bed, bathe her, and provide whatever comfort we could. In these trying hours, in the dark of night, the rest of the house asleep to find strength for tomorrow, we found the unfathomable depths of love making possible the impossible. When she was vulnerable in her literal nakedness, weeping for her lack of control, too tired even to breathe, our fragile care revealed what, in all its depth, all great religions write about love: the light that shines in this darkness is the healing sun of God's love filling us. Our dance together forged boundless bonds. In these despicable hours she smiled most. We whispered "I love you" and said more than we knew. We experienced love's bonds banish pain and nurture peace. Witnessing God loving us as children we cried tears of joy, moved by the mystery of love. In the darkest and heaviest moments for a caregiver, the stars see love through the windows of a dark house with lights on in the bed and bathroom. When Esther was finally back in a clean bed, washed of her pain, angelic peace on her smiling face, sleep came before she felt the pillows. Love unknowable became known. We could love because we were loved. I remember at the time, Henk, I couldn't understand how you and Anita had had the courage to take on what you and Anita took on in caring for Esther as you did in the crisis weeks of her cancer. It seemed exhausting to be sure but almost too intimate. Was that something that aging parents properly did for their dying child? I remember swallowing hard before going into Esther's place to view her at peace or so it seemed on her bed, her skin alight with the sparkles that Sophie has put on her like precious nard, or so I came to think. I remember sitting next to Esther's body, soaking in the quiet, looking at her and seeing yet before me the gift that she was in the world and for those of us graced by her presence. It was then that the rightness of this way of saying we loved/love you to Esther and of honouring her and her Maker came home to me. If I had followed that thread outward I would have already had the answer to my baffled question--the works of love, whatever they be, are always proper. They are mysteries and gifts. But now to see how time has transformed such courage and love into the sounds of wisdom, Henk, well, "by their fruits ye shall know them." And such fruits (this should really be said in Yiddish)! Thanks for sharing. Not just for this either but the privilege of working and being side by side at intervals over the last twenty-five years and more. I have received much over those years, this meditation not the least of your gifts. Works of love do not easily yield their secrets to words, but you found two of the most important: mystery and gift. They cover the instant fulness of love’s presence as well as the never ending growth. And from Him who walked the path ahead of us we know that if anyone is worthy all are worthy. Esther, of course; but Trump too. No wonder we speak of a new earth and of resurrection. And no wonder you discovered Christian Scholarship as a work of love. Thank you Bob.